This year the kids were all home for Easter and the bunny really went all out! Easter fell right before spring break and this year new Easter Baskets were delivered by the darling bunny that did not entirely thrill all the kids. My daughter looked at her basket that was loving filled with candy, jelly beans, and assorted Easter goodies, as well as all the tools needed to wash the outside windows. She said "I think the bunny got this one mixed up with Dad's". The boys were just as fortunate. One received a new colander filled with gardening supplies to grow a fantastic assortment of salad fixings. Another boy received a bucket filled with goodies and everything you'd need to wash the car. 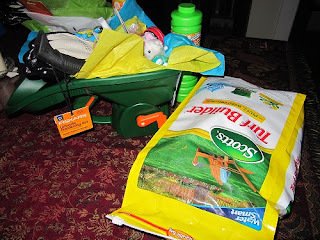 And finally (the best of all) a basket that was actually a new spreader to spread the weed n feed on the lawn. And of course there were bubbles for everyone!